The company makes use of all the available resources to the fullest in order to increase the production capacity. Therefore, the huge workable area is used for storing and manufacturing of the products. Also, hi-tech machinery loaded in the manufacturing unit enable us to deliver bulky consignments within the prescribed time duration. We have state of the art manufacturing facilities with completely modern plant equipment & and advanced technologies. Through regular up-gradation of latest technologies and enhancing manufacturing processes, we create high quality products at competitive prices to give added value to customer's products. At present we have following equipment and facilities installed at our factory. Steam distillation units to extract oil from aromatic herbs. 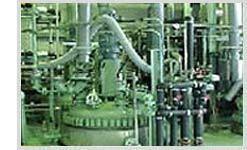 Fully automated Fractional Distillation Facilities made of stainless steel with a capacity of 2800 MT / Annum. Chilling Units and Freezers along with centrifuges of stainless steel with capacity of 200 MT/Annum. Food Grade Storage Tanks made of Stainless steel. 16 stage Filter Presses made of stainless steel for efficient cleaning and packing of crude and rectified oils. Apart from these cutting edge equipment, we have established laboratory facilities that cater not only to our daily analytical needs, but also extend support to our research and development needs. We have a wide range of advance instruments such as Gas Chromatography with polar and non polar capillary columns, pilot distillation apparatuses and reactors, refractometers, polarimeters, different lab apparatuses etc with a big range of solvents and chemicals. As part of our commitment to ensuring a sustainable environment, our facilities are optimized to offer clean & food grade products, with non-pollutant & environment friendly characteristics.